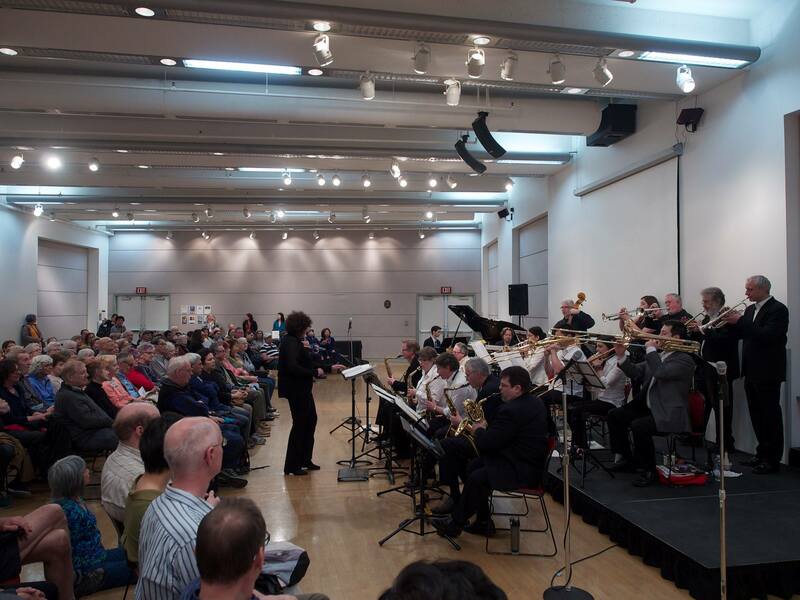 Based in Vancouver, British Columbia, Canada, The AROKIS Centre of Music Society provides an environment for musicians young and old to perform Swing, Latin and Jazz big band music under the guidance of professional musical directors. AROKIS is a registered non-profit organization in British Columbia, and the Society’s bands are available to perform at local community concerts and events in addition to commercial venues. The AROKIS Society was founded in 1989, when Ray Sikora bought property on North Pender Island and made plans to establish a music camp there for young people called “AROKIS Centre” (AROKIS is “Sikora” spelled backwards). That project fell through due to a lack of funds, but was transferred to Vancouver Community College, where Ray was an instructor and band leader. Plagued by health problems, Ray eventually had to abandon the project, and he passed away in 1998. However, the two stage bands he started at the College under the aegis of the AROKIS Centre continued for several years. 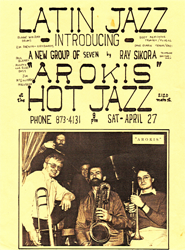 The bands eventually left the College and a non-profit society was formed, “The AROKIS Centre of Music Society”. The two Society big bands now perform under the names Impressions and Urbana. Both bands rehearse once a week under the direction of professional conductors, and perform often in the Vancouver area. AROKIS musicians have added to the cultural richness of our community by performing at numerous free public concerts throughout the region. Venues have included Horseshoe Bay Park, Alexandra Park, Trimble Park, Kitsilano Show Boat, Vancouver Public Library, Hot Jazz Club, Granville Island, New Westminster Quay, Beaver Park, and St. Andrews Wesley Jazz Vespers. AROKIS keeps alive a musical tradition that is not readily available these days. It acts as an art repository and a preservation hall of North American musical history that goes beyond living memory to the era of ubiquitous big bands of the 1920’s, 30’s, 40’s, and 50’s and beyond, fostering awareness of the genre’s composers, arrangers, and musicians. AROKIS has contributed to the development of many excellent jazz musicians and inspired others to start playing big band music. The Society supports local professional musicians by retaining them in roles of conductors, clinicians, arrangers, composers and music chart suppliers. AROKIS fills an important musical niche because its two bands effectively bridge the gap between amateur and professional musicians and between the young and old. Amateur musicians frequently contact the society to ask about prospects of joining one of the big bands, and professional players are able to use their band membership to broaden and maintain their reading and performing skills. The Arokis Centre of Music Society acts to preserve and promote big band jazz in both its historic and current idioms. Central to achieving this objective, the Society engages professional music directors hired specifically for their knowledge of big band music to direct in areas of individual and ensemble playing, development of reading skills and stylistic interpretation in the big band traditions. The Society thereby provides a structured learning environment whereby musicians are equipped to perform the repertoire in the Society’s library ‐ which spans all big band styles ‐ with the highest standard of integrity consistent with its goals. The bands of the Arokis Centre of Music Society perform its repertoire for the public in a variety of arenas, typically in the form of themed concerts that extend educational enlightenment to the public along with the experience of the live big band sounds. Today, AROKIS operates two stage bands, Impressions , directed by Jill Townsend, and Urbana, directed by Robin Shier. AROKIS is an open society. Vacancies are filled by referrals followed by short informal probation periods. The ages of members has ranged between 20 to 80 years of age. Members have included both developing players and semiprofessionals, as well as professionals. The musicians have come from a broad variety of backgrounds, reflecting the cosmopolitan character of the region. The bands also maintain a list of potential substitute musicians. All AROKIS members make regular donations that cover over 50% of the society’s expenses. The public and institutions are also encouraged to make tax-deductible donations to the society. AROKIS has accumulated a substantial library of music charts. To maintain musical excellence, both of the AROKIS bands hold 35 two-hour rehearsals per year. Playing in the big bands and attending weekend workshops have offered member musicians unique opportunities to learn from accomplished professionals. Many member musicians share their skills as members of other community bands. Copyright © 2019 Arokis Centre of Music Society. All Right Reserved.